WELLINGTON, New Zealand — This is a dog story. It's about a plucky little Jack Russell terrier named George, who stood like a giant against two marauding pit bulls and gave his own life to save five kids from the steel-trap jaws and razor-sharp teeth of the vicious attack machines. Local officials say it's also a story about the people who trained the pit bulls to kill and who may have fed the animals methamphetamines to make them even more deadly. The tragedy unfolded Sunday afternoon on New Zealand's North Island, in the town of Manaia, where a group of children — and George — were walking back from a trip to the candy store. Out of nowhere, the children told police, the two pit bulls lunged at them. One of the kids, Richard Rosewarne, 11, told the local paper that George never backed down against the pit bulls, doggedly refusing to let the them get at his little brother, 4-year-old Darryl. "George tried to protect us by barking and rushing at them, but they started to bite him — one on the head and the other on the back," Rosewarne said. "We ran off crying and some people saw what was happening and rescued George." 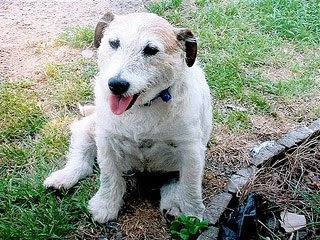 It was too late, however, to save the little 9-year-old terrier. Steven Hopkinson, the veterinarian who treated George, said the dog's wounds were the worst he'd seen. Putting him down, Hopkinson said, was the only option. For Allan Gay, George's owner, the loss is especially devastating. He lives alone and George had been his faithful companion for seven of his nine years, inheriting the pup when neighbors moved away. "These two pitbulls rushed up and were going for the little boy," Gay said, choking back tears. "George went for them, it's what he would do. He didn't stand a chance, but I reckon he saved that boy from being chewed up. "If it wasn't for George, those kids would have copped it," Gay said.